Copyright SaratogaFlag.com. All Rights Reserved. eCommerce Software by 3dcart. Custom Manufacturer & Retailer • Dedicated to Finding A Solution for your Visual Communication Projects! Professional Artists Manufacturing in Upstate New York Since 1994. 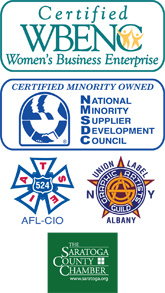 • IATSE AFL-CIO Local 524 • UNION-MADE IN USA • WE HONOR THOSE WHO SERVE!